What Are The Odds Of Hitting 60°+ In January? The last time Cincinnati saw a 60°+ high temperature in January was January 31, 2012. The last time before that was all the way back in 2008 (61° on January 8th). We don’t always get to see temperatures in the 60s in January. 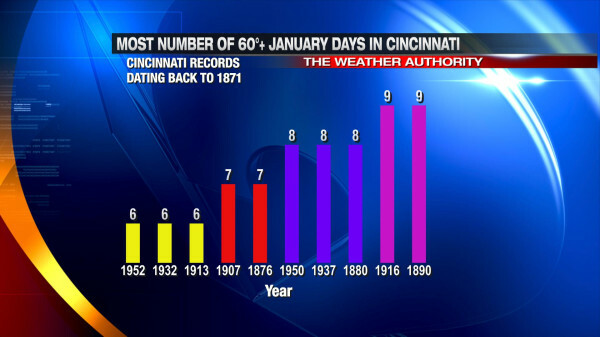 We average about two 60°+ days each January in Cincinnati, but we once went 5 years straight without hitting 60° in January (1976, 1977, 1978, 1979, and 1980) . After crunching the numbers, I was a little surprised the odds were this high. In January, getting a high in the 60s usually requires strong southwesterly flow, no snow on the ground, and an abundance of sunshine. For perspective, the historical odds of hitting 65°+ any given January day is roughly 1.8%. The historical odds of hitting 70°+ any given January day is roughly 0.2%. The odds of us hitting 60° Friday and Saturday are good, especially with moisture surging up from the south and allowing lows temperature to only fall into the upper 40s to mid 50s. If you love warm weather, enjoy the spike in warmth late week because high temperatures will be near average in the mid to upper 30s Monday, Tuesday, and Wednesday.